Wine is a social drink which should be enjoyed in the company of friends and .. food. The right combination between food and wine is a source of ultimate bliss for every connoisseur. Both wine and food can benefit from the right pairing. The right wine can accentuate unexpected gastronomical aspects of food and vice versa, wine can shine in a new light when accompanied by the right dish. In order to savor the splendor of such combinations, one does not need to frequent expensive restaurants and buy overpriced wines. Rather, when combining food and wine it is one’s intuition and curiosity that are of paramount importance. Most rules for agreeable food - wine combinations date back to the 19th century and are made by French cooks who travel around Europe showing other nations the French savoir-vivre. It is since then that we know that champagne goes well with oysters, white wine – with seafood, and red wine – with game and red meats. Those rules, however, have been broken many times throughout the years because the nature of certain dishes and the rich wine variety available allow for a much freer interpretation. For example, some red meats could be made more enjoyable by stronger white wines. A more practical approach for combining wine with food is to avoid any possible dissonance between them. For example, an exceptional wine stands out much better when accompanied by a not so sophisticated dish that will bring out the wine’s superb qualities instead of fighting with it. Certain wines and foods have “found” each other over the years and represent especially suitable combinations. Generally those are the regional wines and foods. Almost all local dishes go best with the wines from their regions. Try to balance the weight of both, i.e. heavy dishes and those with a strong taste, such as game and red meat should be enjoyed with an equally heavy wine. In most cases those are red wines but some full-bodied whites could be an equally suitable alternative. Dry wines could develop a very unpleasant sour or even bitter taste if served with desserts. 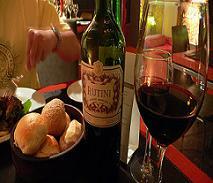 Generally deserts are served with wines that are at least comparably sweet, if not sweeter. Wines with high acidity go best with heavy, rich in fat dishes. This is because the high fat content negates the impact of the acid. High-tannin wines should be combined with foods rich in proteins. The proteins combine with the tannins, thus diminishing the tannin taste. Wines made from grape varieties that contain a lot of tannins, such as Cabernet Sauvignon and Syrah are an excellent match for red meats and other protein-rich foods. On the other hand, high-tannin wines acquire an unpleasant metallic taste if combined with fish and other seafood. Or they could have an extremely bitter taste when combined with salty dishes. So finally… which wine? You could have in mind the rules above when making your selection but don’t be blinded by them and never take things for granted. Even when you are convinced that you have found the perfect wine for a certain dish, a small change, such as a bad yield, a change in the production technology, or other, could disappoint you. So have an open mind and be ready to experiment. Needless to say, a lot of times the results would be a bit strange but that’s what will make the whole experience interesting! !